The new head of Bombay House says "I look forward to Mr Tata's guidance in the year ahead in meeting the expectations of the group...I take this responsibility very seriously and in keeping with the values and ethics of the Tata group. I will disassociate myself from my family businesses." Welcoming his appointemnt as the new Tata sons chairman, Cyrus P Mistry, son of Pallonji Mistry, thanked Ratan Tata and the entire group for "honouring" him with the reposnibility. Father Pallonji Mistry is athe largest share holder in the Tata group. This is the second time in the company's 143-year old history that a non-Tata will head the group - Sir Nowroji Saklatwala had led the group between 1932 and 1938. MUST READ:Who is Cyrus P Mistry? Mail Today while profiling Cyrus Mistry says "A Tata insider, who in Mumbai does not carry the wellknown family name, will take over as chairman of the salt-to-software business conglomerate from Ratan Tata who retires next year." The board of Tata Sons on Wednesday took many by surprise as it appointed 43-yearold Cyrus Pallonji Mistry as deputy chairman of the $77.4 billion group - it has $83.3 billion in revenues - setting aside speculation over the succession issue at the Tata Group. The appointment ends a 15-month search for the next Tata boss. It also means that going by the company's current retirement policy, the reclusive Mistry could be at the helm of the group for over three decades. This is the second time that a non-Tata will be taking over as the group's chairman. Sir Nowroji Saklatwala had been the group's chairman between 1932 and 1938 before JRD Tata took over to lead the company till 1991. Ratan Tata, who is behind the dramatic increase in the group's operations and size, will groom Mistry for a year before the latter takes over as chairman in December next year. Mistry, however, is well acquainted with the Tata story. His father, Pallonji Mistry is the single-largest individual shareholder of Tata Sons while he has been on the board of Tata Sons for over five years. "I feel deeply honoured by this appointment. I am aware that an enormous responsibility, with a look forward to Mr Tata's guidance in the year ahead in meeting the expectations of the group," Cyrus Mistry said soon after his appointment. "I take this responsibility very seriously and in keeping with the values and ethics of the Tata group, I will undertake to legally disassociate myself from the management of my family businesses to avoid any issue of conflict of interest," he said. "The appointment of Cyrus P Mistry as deputy chairman of Tata Sons is a good and far-sighted choice. I have been impressed with the quality and calibre of his participation, his astute observations and his humility," said Ratan Tata while endorsing the appointment. "He is intelligent and qualified to take on the responsibility being offered and I will be committed to working with him over the next year to give him the exposure, the involvement and the operating experience to equip him to undertake the full responsibility of the group on my retirement," Tata said. As per the group's retirement policy, he will retire in December 2012. "I congratulate Cyrus Mistry on his appointment to the leadership position at Tata Sons. I take this opportunity to extend my best wishes to him for carrying forward the rich traditions of the group and taking its businesses to even greater heights in the years to come," said Chanda Kochhar, managing director and CEO of ICICI Bank. Mistry is the younger son of Pallonji Mistry, who holds 18.5 per cent stake in Tata Sons, the holding company of the Tata group respected in India for over 140 years for its adherence to strong values and business ethics. Pallonji Mistry commands considerable clout in the Tata group. According to insiders at Bombay House, the Tata group headquarters in south Mumbai, Cyrus Mistry is a compromise candidate. His brother-in- law and Ratan Tata's half brother Noel Tata had been the frontrunner for the chairman's post. But Tata was not too keen to appoint Noel as his successor stating that he was yet to master the desired skills and have exposure to lead the group. Last year a five-member selection committee was set up to pick the next Tata chairman and Cyrus Mistry was initially one of the members. The others on the panel were N.A. Soonawala and Shirin Bharucha representing Tata Trusts, Lord Kumar Bhattacharya and R.K. Krishna Kumar representing Tata Sons. The committee unanimously recommended Mistry's appointment as Tata boss. Mistry, currently managing director of the Shapoorji Pallonji Group, is a graduate of civil engineering from Imperial College, London. He has a master of science in management from the London Business School. Cyrus Mistry has very little public interaction and maintains a low profile like his billionaire father whose wealth according to Forbes has been estimated at $8.8 billion. His elder brother Shapoor Mistry handles his father's construction business. The challenges before the group have multiplied as it has ventured into overseas market in the past years with the acquisition of Corus by Tata Steel and Jaguar Land Rover by Tata Motors. Tata Chemicals has also acquired several companies abroad including British Salt. 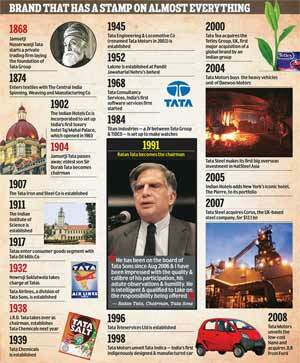 The Tata group has over 100 operating companies and has operations in more than 80 countries. Over 58 per cent of its revenues come from businesses outside India.